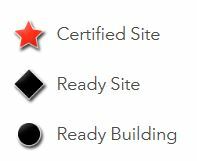 Our Certified Site, Ready Site, and Ready Building Programs offer a variety of sites and buildings across our eight states that are ready to accommodate your relocating or expanding business needs. Working with our economic development partners, we have developed site options to increase your speed to market. Along with our nation-leading renewable energy portfolio and attractive rebate and incentive options, we work to create customized energy solutions for you to grow your business. Select a star above or a state below for more information.